The cost of rods and reels can really add up. It is not uncommon for the average angler to pay upwards of $300+ dollars for a single rod and reel combo. Whether or not you are one of those anglers, it is important to protect some of your most valuable tools when it comes to kayak fishing. After all, you cannot kayak fish without a fishing rod even if it is an old cane pole. In this article, we will be looking at the different styles of rod holders and the best uses for each one. You may have bought a kayak that was never intended for kayak fishing. That’s okay because you can easily outfit your kayak to become a new fishing machine. 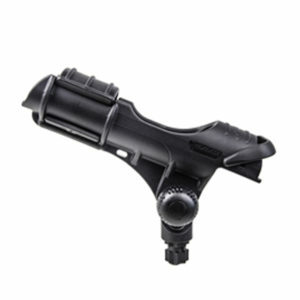 A great way to start is to add a YakGear Flush Mount Rod Holder Kit. Flush mount rod holders are the most basic style of rod holder and are usually installed in pairs behind the seat in the transition valley from the cockpit to the tankwell. They are often installed at a slight 45° angle so that you may easily access the rear tankwell storage of your kayak or use them for trolling. The YakGear Flush Mount Rod Holder Kit comes with an integrated mounting surface for a padeye, included in the kit, so that you may have an attachment point for a rod leash (not include in the kit). If you happen to flip your kayak and have your rods leashed, they will not be lost. We recommend using a rod leash when traversing in your kayak. We’ll go over leashes and other rod insurances in a moment. If your kayak already has flush mount rod holders, you may find that your reels are a little too close to the water and are getting wet. This often happens to kayak anglers who go through the surf to fish offshore or to kayaks that have a low profile. For kayak anglers who fish saltwater, this is not ideal as the saltwater can have a negative impact on the performance of your reels. One way to remedy this is to use YakGear Rod Holder Extenders. 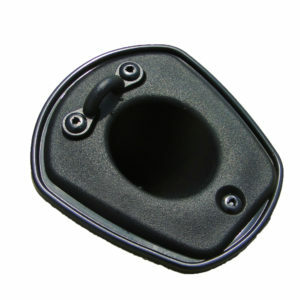 These rod holder extenders are a universal accessory that will fit into most flush mount rod holders whether they are molded in the kayak from the factory or deck mounted flush mount rod holders. Rod Holder Extenders elevates your rod 9 inches over the deck of the kayak keeping them high and dry, prolonging the performance and life of your fishing reels. Most kayak anglers re-purpose milk crates for basic storage on their kayaks. Milk crates are a great way to manage tackle and other items that you need immediate access to, but they lack in options. One of those options being rod storage. 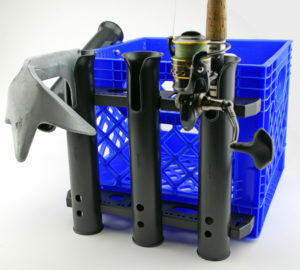 That is why YakGear offers a convenient way to add rod storage using the Build A Crate Rod Holder Kit. The kit comes with all the necessary installation hardware and comes in quantities of 1, 2 or 3 rod holders. Using these style of rod holders makes it very quick and convenient to load and unload your kayak at the launch because all of your gear is in one easy to carry milk crate. For more milk crate storage options, check out the YakGear Cratewell and YakGear’s Kayak Angler Crates, that include everything you need to get started. For beginners, it is an easy way to get on the water and start fishing without drilling any holes in your kayak. One of the most popular styles of rod holders, Railblaza’s Rod Holder II is a universal rod holder that can accommodate conventional casting, spinning, or fly reels. 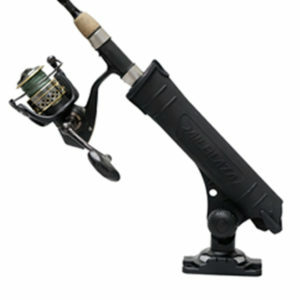 It uses a collar lock system and an industry first fold down gimbal which allows you to safely use the rod holder when trolling for large game fish. The Rod Holder II uses the patented StarPort mounting system which offers you a fully customizable 360° horizontal range. Once installed, the StarPort also gives you the ability to use Railblaza’s full line of accessories shown here. All Railblaza rod holders can be adjusted over 90° vertically, giving you the freedom to fine tune your rod holders to your liking. 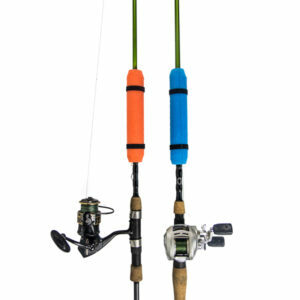 The little brother to the Rod Holder II is the Rod Holder R. The Rod Holder R is a light duty rod holder that features a stretchable strap along the front of the rod holder which accommodates conventional casting, spinning, or fly reels just like the Rod Holder II. Because of the stretchable front strap, the Rod Holder R is not the recommended rod holder for trolling but is ideal for rod storage while paddling/pedaling. All Railblaza products are made using fiberglass reinforced plastic to keep the weight down but ensure long lasting durability. It’s convenient to have a secure place to quickly set your rod after you’ve landed your catch. The Railblaza Rod Tube is my favorite accessory for staging my rod after I’ve landed a fish. I like to have the Rod Tube positioned in front of me either positioned straight up or at a slight pitch with the tube facing towards the angler. This allows you to quickly and securely stage the rod out of the way so that you may use both hands to remove the hook and manage the fish. 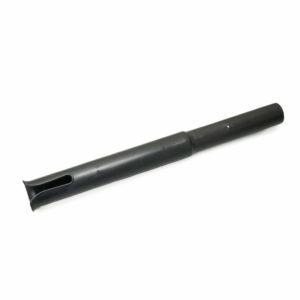 The Rod Tube is also used as an alternative to the YakGear Rod Extender Kit. 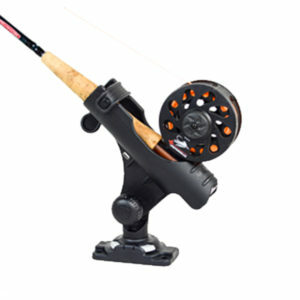 The Rod Tube elevates your fishing reel to protect it from waves and splashes. Like the Rod Holder II, it also has the first fold down gimbal offered on a rod holder. We know accidents happen. The saying goes “Leash it or lose it”. This is especially true with kayak anglers who venture through the surf. So, with the addition of rod holders, it is good practice to use rod leashes for additional protection. 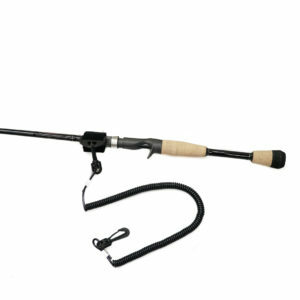 Replacing lost rods and reels can add up quickly and after all, a rod leash is much cheaper than a new rod and reel. There are many leashes that YakGear offers and my personal favorite is the Coiled Rod Leash. This is a nonabsorbent 24”-60” rod leash that firmly holds the rod using a detachable Velcro strap. You can comfortably leave it attached or remove it while in use. Check out our full line of rod and paddle leashes here. If you feel that rod leashes may get in your way, then check out the YakGear Rod Floats. Rod floats offer great protection for your rods and are one of the most affordable insurance policies. Great for kayak anglers who occasionally wade fish. The purpose of this guide is to help you understand the multitude rod holders available to you so that you may confidently choose the rod holder that is right for you. Thank you for reading and please feel free to reach out to us with any questions you may have.